Projection Screen Perforation Explained | Northmar, Inc. 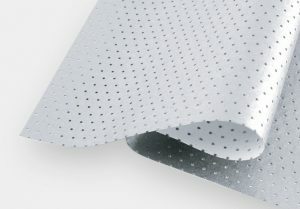 There are many types of perforation options for a projection screen. When the audience is seated closer to the screen it is best to choose a micro or mini perforation pattern to make sure the audience does not see the holes. As the audience is seated further away, larger hole patterns can be used without being visible. Premium HGA 3D Silver screens are the screen surface of choice for premium large format installations worldwide. A technique for enhancing the realism of video on screen is to place the speakers directly behind the screen so that on-screen voices and sound effects are heard to come directly from their sources on the screen. To accomplish this, screen perforation is necessary to allow the sound to pass through the viewing surface. Perforation refers to the small holes in the viewing surface, which allow sound from speakers placed behind the screen to move through the material to be heard by the audience. Sound pressure that passes through the viewing surface, measured in decibels (dB), varies by frequency and is charted on sound transmission curves. The characteristics of sound movement are unique for each perforation pattern. Screen and sound designers evaluate these curves along with the visual requirements of the setting to plan the type of perforation chosen and the sound control systems needed to optimize the viewing experience. 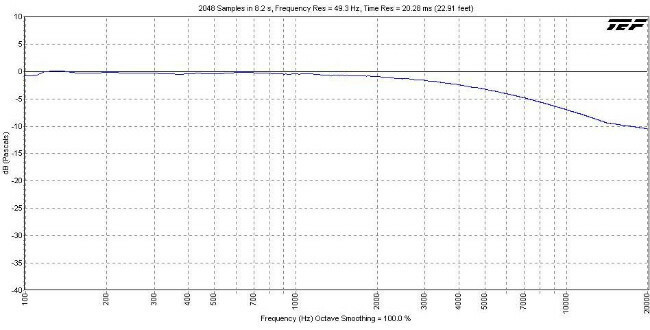 Here is a fairly typical example of a sound transmission curve for a generic type of screen perforation. The horizontal axis shows frequency measured in Hertz (Hz). Most humans can detect frequencies between 20 Hz (low) and 20,000 Hz (high). Lower Hz sounds are the lower bass sounds, which have long wavelengths. High Hz sounds are the high pitched treble sounds and have short wavelengths. Sound in the higher Hz range is more impacted by passage through the screen surface. On this graph, the vertical axis is expressed in the decibels (dB), used to describe how loud a frequency is heard. The image below shows the decrease in dB relative to Hz as sound hits the screen. Sound engineers refer to this as a roll-off of the high frequency sounds and design the systems to equalize the sound pressure across the audible spectrum. Although sound transmission curves are a great tool to compare acoustic performance of different types of projection surfaces, they are certainly not the only element to consider when selecting the appropriate perforation pattern. Otherwise, the choice would simply be limited to the surface that is most permeable to sound. A compromise has to be made between acoustic performance and visual performance. That is why most manufacturers offer several perforation options. though no material can be totally ‘transparent’. There will always be some amount of sound lost when it hits a surface. These acoustically transparent surfaces are made of two primary types, perforated vinyl or woven fabrics. Perforated vinyl screens have the holes punched through them in a specific size and pattern that will be discussed later. Woven screens are typically made of nylon or polyester and the gaps in the woven surface allow the sound to pass. Whenever a screen has more void area, it means there is less area on which the image is reflected. In a separate article we discuss the subject of screen gain. For this article, it is important to recognize that for any given surface, the gain of an acoustically transparent surface is reduced by the voids in the surface when compared to a solid version. Projector output must be chosen accordingly to achieve the level of brightness required for the viewing room and content. There are many types of perforation options for a vinyl screen. When the audience is seated closer to the screen, usually within 15 feet (4.5m), it is best to choose a micro or mini perforation pattern to make sure the audience does not see the holes. As the audience is seated further away, larger hole patterns can be used without being visible. The smaller, closer together holes, of a microperf design have less impact on the transmission of the high frequencies, but this adds cost to the manufacturing of the projection surface. This trade-off between audio performance and visual performance is a key consideration in selecting the type of perforation. Another element one must consider is the moiré effect. Moiré is a visual effect caused by the interaction between the pixel grid and the perforation pattern. If pixels align with the perforation holes while displaced or rotated a small amount from one another, a wavelike pattern appears. You can see an example of this pattern by folding a window screen in half. The moiré effect can significantly degrade the quality of a projected image. Perforation patterns have been established to mitigate the moiré effect for standard, 1080p and 4K resolutions as well as for different light engine designs to ensure that moiré does not interfere with image quality. However, because moiré interference decreases as the pixel grid becomes denser, higher resolution projectors will soon make moiré a thing of the past. Reputable screen manufacturers carefully analyze their perforation patterns and the effects that different projector resolutions have in order to offer options suitable for different projection set-ups. They also must provide sound transmission curves in order to compare the acoustic performance of each material. These characteristics of perforation patterns are of great importance to the audience’s overall audio-visual experience.